While it’s not the immediate, standout build-around card that The Gitrog Monster was, another Golgari monstrosity is piquing some interest. An obvious EDH bomb, I identified this as a card to buy at its floor. It seemed too slow for Standard but its power was obvious in EDH. On the Brainstorm Brewery podcast, Ryan said that he was going to go pretty deep on $2 copies of the itsy bitsy Grafwidow and I opted not to join him. 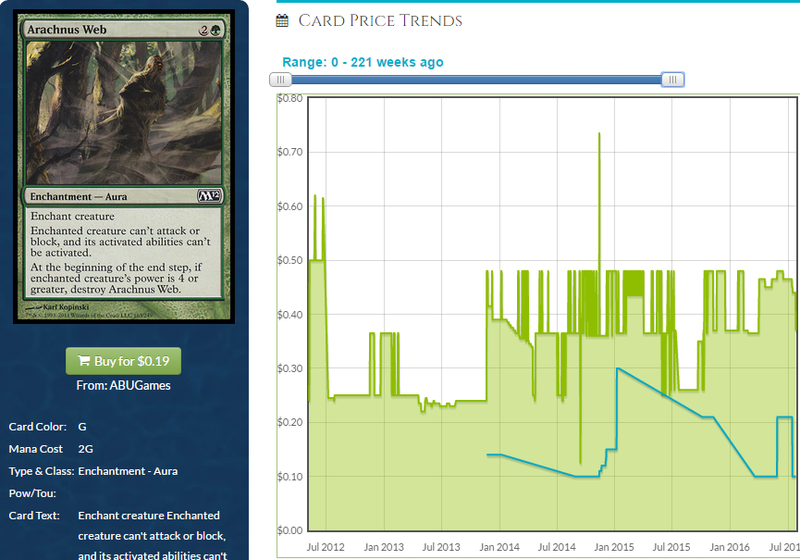 It’s not that speccing on golgari cards in the past hasn’t paid dividends – I’m writing this article on the computer I bought with profit that was in part to Deadbridge Chant spiking to $10 after all. But this didn’t seem like it could impact Standard all that much. Wish I’d bought in, frankly. 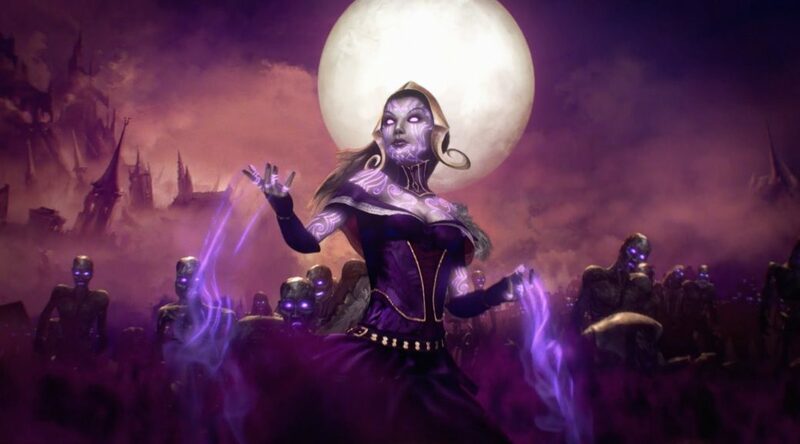 I have stayed away from speculating on Standard cards for so long I can’t tell if a card is good or just good in EDH. Then it spiked to $10. Unless you listened to our set review episode and agreed with Ryan and dropped a few hundo on $2 copies of the Grafwidowmaker you aren’t in a position to make much money from her directly. However, you may remember that one of the things I do in this series is scour decklists to try and find financial opportunities. Older cards that suddenly are getting more play due to people building a new deck can suddenly become worth money, especially if they go from trash to staple the way a new deck can make cards do. I think there is money to be made on a few Ishkanah staples and there is still time to get in. I am not going to load this article up with a ton of preamble this week because I basically am not feeling my typical, jovial self. This card is going to do something someday. Basically, whenever a card is unique in its effect, you need but ask whether you think casual players might one day be interested in the effect. If the answer is yes, you have a delicate balancing act to think about. Is the card good enough that lots of casual players playing lots of decks will want it but not good enough that they need to reprint, functionally or otherwise, the card for future sets? I don’t know that they’ll feel the need to give us another Assault Formation any time soon, but making everything Doran opponents in the face is a cool effect. Spiders and other big-butted creatures get a massive upgrade from this. Legacy and Modern players can even use Assault Formation to kill opponents Tarmogoyfs with their Tarmogoyfs and break up ground stalls. I mean, they won’t, but they can and that matters. You know, to me. Modern is also giving this deck a bit of a bump in noticeability because MTG Price’s own Corbin Hosler is streaming some doofy Doran deck in Modern where you use Zur the Enchanter to snag Assault Formation so he can attack for 4. There is removal and stuff he can also grab. The deck is a pile, but if piles didn’t move prices, Travis Woo would be out of a job. You know, more. This could put some pressure on the price, also. Those two factors may not be enough to drive the price right now but all that means is that you have more time than you would if Corbin’s stupid deck got played on camera (I know he streams, but I meant a camera that has people watching. I don’t even watch him stream and I’m friends with him. I bet even his wife doesn’t watch his stream. Still, he writes for TCG Player, now and that has to count for something. At least the card is getting put in people’s minds. I think you have a while to move on these, but I think you’re safe going pretty deep. This seems like a no-brainer. I don’t know that this gets printed again easily and it’s narrow enough that there won’t be much pressure to do it even in the few avenues where they could do it. This is in a precon that theoretically has $60 worth of cards in it, but a lot of that is presuming you can get $0.50 for a lot of the uncommons. It basically has an $8 Commander Beacon, a $5 Eternal Witness and a $4 Solemn Simulacrum. These decks aren’t super worth picking up at MSRP to flip so basically the decks are going to players. This card is above its historic low but it didn’t stay there long. It’s trending up-ish thought not enough to make a pronouncement. I think there are enough $3-$5 cards in Eldritch Moon that will be $0.50 next month that you should start sheltering your value by trading for a $3 card that has upside like this. This doesn’t just go in Ishkanah decks, but 90% of the Ishkanah decks uploaded to EDHREC run it so if that deck is popular at all, this card will be, too. If this goes down at all, I like it. If this goes up at all, I like it even more. The rest of the deck is pretty cheap, and that’s appealing, too. When a deck can be built as cheaply as this deck can, it becomes appealing to foil the deck out. That can present challenges but people will still try. One challenge is the disparity in foil multipliers for other-format staples and also for cards that are reprinted in non-foil in Commander sets but are only foil in the original set. 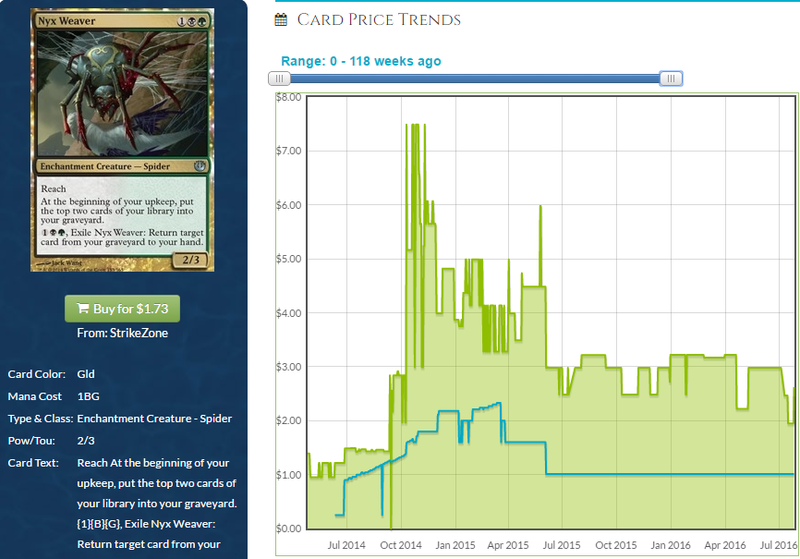 $30 foil Urza’s Incubator doesn’t care that the non-foil is $4, now. Still, it’s a deck where, once the artifacts like Door of Destinies, Ashnod’s Altar (ouch) and Sol Ring (I may skip this one) are foiled, you can finish it cheaply means people might try it. 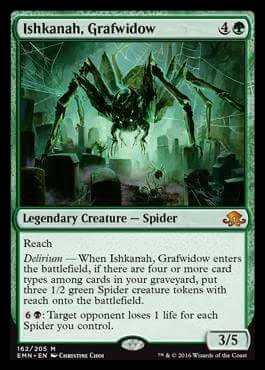 A lot of the spiders are affordable but there aren’t a ton of them and there could be opportunity here, if only just to trade the foils off. These come as a set, and 75% (heh) of the Ishkanah decks are running this combo. 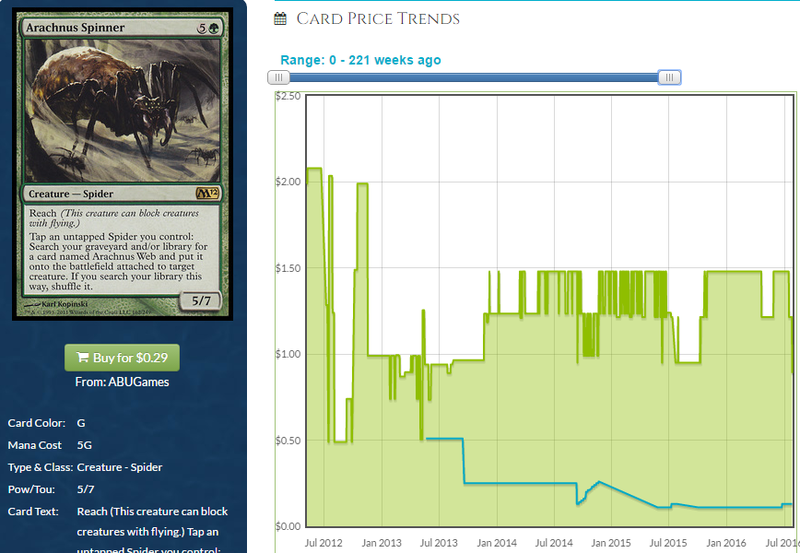 Cheap spiders are easy to buy a few playsets of affordably and watch the price go up over time. 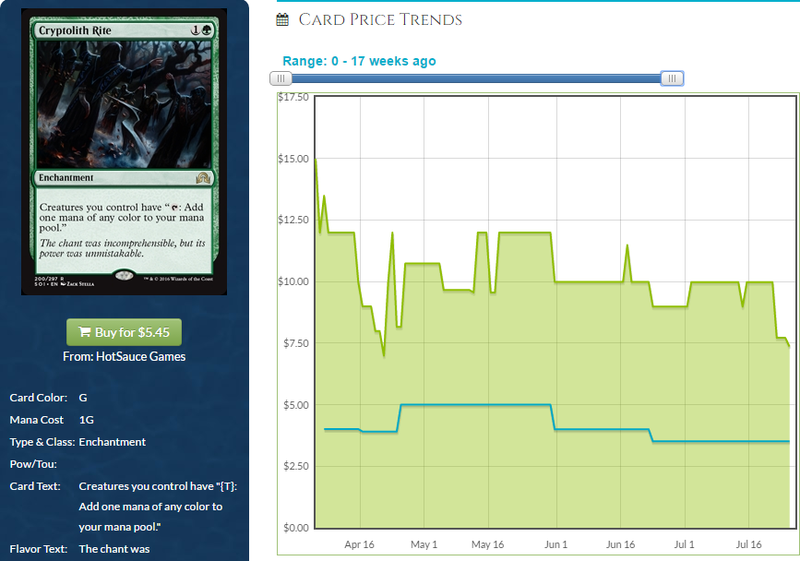 This was reprinted in a Commander precon which means as the non-foil price goes down, we’ll see greater and greater divergence of the foil price, which is already trending upward at points. We’re not getting more copies and even though dealer confidence went down with the reprint of non-foils, demand is going to eat copies eventually and when supply can’t catch up, the price will. This card, near its historic low, has a mere 10x multiplier. Standard used this and maybe Modern will, so the additional potential exposure from some crazy Modern dredge thing could give this some traction on top of a crazy foil spiders deck. Dealers are staying pat on this, but a second spike will be harder and they’ll be flat-footed so maybe take a look at this. Early Standard adoption messed this price up for life, basically. The non-foil is tanking but the foil doesn’t know what to do. Dealers aren’t in a hurry to race to the bottom so I feel like it’s in a weird spot. I’m not enthusiastic about its current price and I feel like it will be $3 before it’s $7. 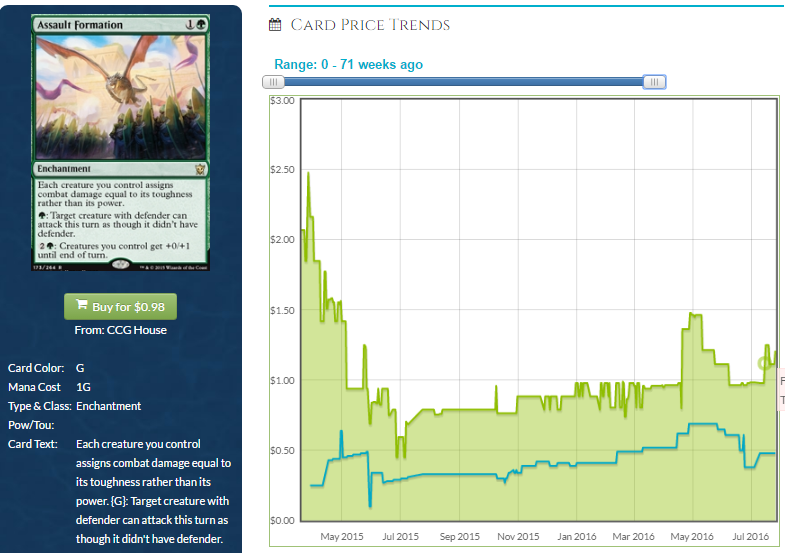 This is gross, but people may want to buy it now, and you never know if Standard somehow spikes this if people adopt Ishkanah in Standard. Strangers things have happened. 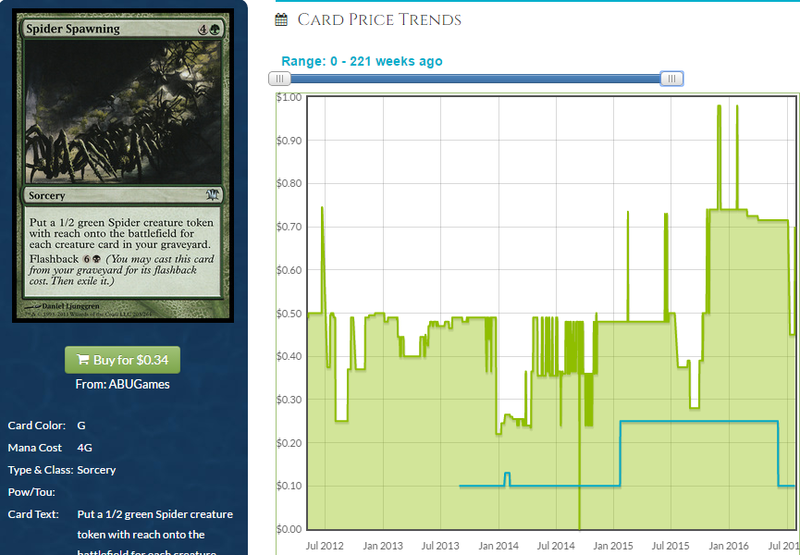 Also, buy basically every single spider that goes in the deck in foil, if you can. People who build this deck run a lot of crap spiders from the pre-foil era and a foil deck would have to leave them out (We hardly knew ye, Root Spider) but the deck is doable in foil. I don’t think a ton of people will build it, but it will be tempting once people see how cheap most of the cards are. 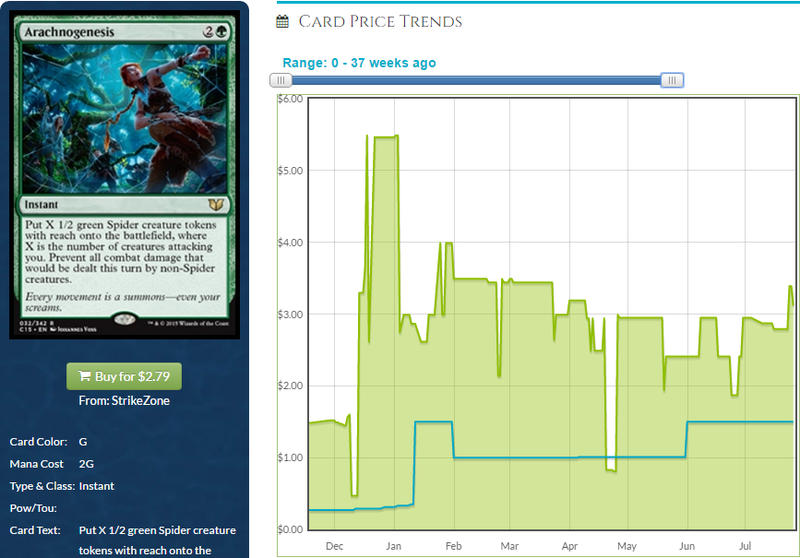 Any cards, like Cryptolith Rite and Spider Spawning, that see play in other decks will have additional upside exposure and are better buys. That’s about all for Grafwidow. Join me next week where the topic of discussion will be something else.